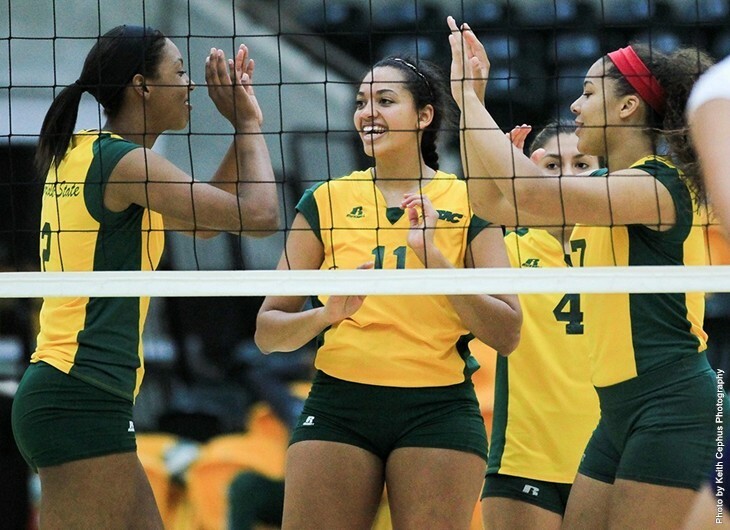 NORFOLK, Va. – The Norfolk State volleyball team will play its first conference road match this Friday when the Spartans take on UMES at 6 p.m. at the W.P. Hytche Athletic Center in Princess Anne, Md. NSU’s only match within a nearly two-week span will find the Spartans aiming for their first MEAC win of the year, while the Hawks will look to bounce back after dropping their first conference match of the season. UMES carries the best overall record in the MEAC at 11-3, while NSU dropped to 1-14 overall after falling to Coppin State and Morgan State last weekend. Live stats for the match against UMES will be available here. After kicking off the season on a high note, the Hawks dropped a 3-0 contest against Howard last Friday in both teams’ first MEAC contest of the year. UMES had by far the best overall record in the conference before that matchup, but the Bison defeated the Hawks and then DSU to take the early lead in the league standings. All three of UMES’ losses on the year have come in the last four matches. The Spartans, meanwhile, lost in three sets to Coppin State at home last Friday and then took Morgan State to five sets before falling to the Bears on Sunday. NSU had a 2-1 lead in the match with MSU before losing the last two sets. The Spartans are attempting to break a seven-match losing streak in which three of those losses went to five sets. Along with Howard, Coppin State and Morgan State also went 2-0 last weekend, with NSU and Hampton (twice) and UMES and Delaware State (once) failing to pick up their first conference wins. Bethune-Cookman and Florida A&M won both of their matches last weekend to take the early lead in the South standings. In the North, the only other match on Friday involves Howard playing at Morgan State. UMES will host Hampton on Saturday, and Howard will also make a trip to Coppin State on Sunday in a light weekend for the division. Senior setter Darcy Moore ranks sixth in the MEAC in assists now at 7.91 per set. Three other Spartans also find themselves in the rankings, including senior Angie Darcus in points (9th, 3.25) and kills (10th, 2.86). Juniors Dominique Parker and Alex Irizarry also sit ninth in their respective categories, with Parker tallying 0.31 service aces per set and Irizarry contributing 3.14 digs. NSU’s highest-ranked team category continues to be service aces, as the Spartans have posted 1.23 per set for fifth in the conference. NSU also sits sixth in digs (13.63), seventh in assists (9.63) and opponent hitting percentage (.238), eighth in kills (10.19), ninth in hitting percentage (.112) and 12th in blocks (1.10). Already the all-time leader in assists, Moore needs just 101 more to reach the 3,000 plateau. She also currently ranks eighth in career digs (691), 10th in matches played (95) and sets played (351), and 15th in service aces (80). Darcus stands 11th in matches played (86) and 15th in kills (419) and assists (177). The only other current active player is Irizarry, who sits one spot ahead of Darcus in career assists at 14th (196). UMES is led offensively by a pair of players, Zuzana Ondruskova (3.32 kills) and Lucia Babic (2.90 kills, MEAC-best .297 hitting percentage). The Hawks lead the conference in hitting percentage as well as opponent hitting percentage, kills, assists, service aces and digs while also ranking second in the only other team statistical category kept, blocks. Petra Jerabkova has handled most of the setting duties with a conference-leading 9.08 assists per set, and Andjela Reljic has tallied a team-best 18 service aces. Reljic also leads the conference with 5.08 digs, with Ondruskova (2.50) and Jerabkova (2.30) also chipping in. Alana Polk ranks third on the team with 1.76 kills but first in the MEAC with 1.16 blocks per set. The Spartans will wait a week until their next contest, at Howard on Oct. 11 at 3 p.m.